The EarlyTox™ cell viability assay kits are a family of fluorescence-based reagents for the assessment of cell viability, cell proliferation, and various apoptosis events using mammalian cells. Optimized for use with microplate readers, these assay kits employ a no-wash, homogeneous assay protocol that enables characterization of a full concentration-response profile of test compounds. Cell viability assays are critical to a broad spectrum of research areas ranging from investigation into the mechanisms of cell death to the development of new therapeutics targeting apoptosis in diseases. One of the most popular detection technologies for cell viability is a fluorescence microplate reader. The EarlyTox cell viability assay kits from Molecular Devices have been optimized for highly sensitive and accurate microplate detection which provides a complete solution for monitoring cell viability. This kit enables the detection of the live population of mammalian cells using a fluorescence microplate reader based on the integrity of the cell membrane and the intracellular esterase activity. Calcein AM is a widely used live-cell marker. The non-fluorescent calcein AM permeates the intact cell membrane and is converted into calcein, the fluorescent form, by intracellular esterases. The number of live cells is therefore indicated by the intensity of green fluorescence in the cytosol, with excitation at 495 nm and emission at 530 nm. The low cellular toxicity of calcein AM also enables long-term cell tracing and cell proliferation assay. This kit enables analysis of apoptosis based on caspase-3/7 activity and its consensus target sequence, Asp-Glu-Val-Asp (DEVD). Caspase-3 and caspase-7 are proteases that are activated during the execution phase of apoptosis. This kit provides a single-step, homogenous assay that is specifically designed for microplate readers. The fluorogenic substrate (Ac-DEVD)2-R110 contains two DEVD consensus target sequence and is completely hydrolyzed in cell lysate by the enzymes. Hydrolysis of both DEVD peptides releases the green fluorescent dye R110, resulting in a substantial fluorescence increase, with excitation at 490 nm and emission at 520 nm. The assay kit includes the competitive caspase-3/7 inhibitor Ac-DEVD-CHO for use as a negative control. R110 is also provided in the kit for generating a standard curve, which can be used for quantifying caspase-3 activity. This kit enables enable detection of apoptosis in intact cell populations based on the measurement of caspase-3/7 activity using either a fluorescence microplate reader or a fluorescence imaging system. Caspase-3 and caspase-7 are proteases that are activated during the execution phase of apoptosis. 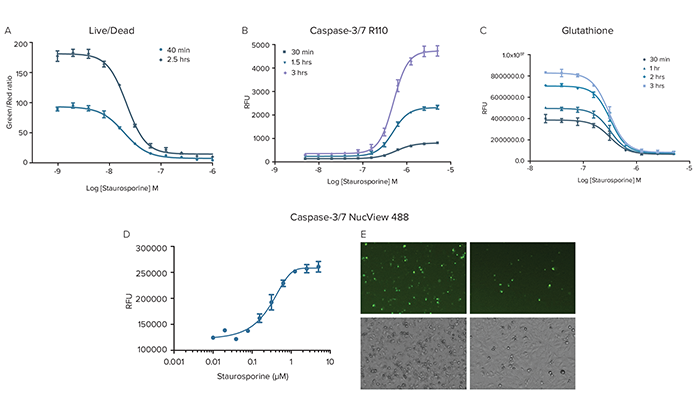 NucView 488 Caspase-3 substrate (formulated in DMSO or phosphate-buffered saline (PBS), for EarlyTox Caspase-3/7-D NucView 488 Assay Kit and EarlyTox Caspase-3/7 NucView 488 Assay Kit, respectively) is used to detect caspase-3/7 activity within intact cells without interfering with caspase activity. The substrate consists of a fluorogenic DNA dye that is coupled to the caspase-3/7 DEVD recognition sequence. Initially non-fluorescent, the substrate permeates the plasma membrane and enters the cytoplasm. In apoptotic cells, caspase-3/7 cleaves the substrate, releasing a high-affinity DNA dye that migrates to the cell nucleus and stains DNA with bright green fluorescence, with excitation at 500 nm and emission at 530 nm. NucView 488 staining is formaldehyde-fixable and compatible with subsequent immunostaining. The assay kit includes an optional masking reagent to reduce background fluorescence when necessary. The PBS formulation is recommended for cells that are sensitive to DMSO. This kit enables the detection of an early apoptosis event based on the measurement of the glutathione content in live mammalian cells using a fluorescence microplate reader. 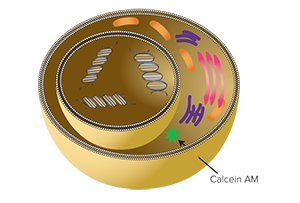 Diminished cellular glutathione (GSH), which is an important anti-oxidant in mammalian cells, occurs at the early stages of mitochondria-associated apoptosis because of GSH efflux. This kit uses monochlorobimane (MCB), a cell permeant dye that has a high affinity for GSH, to detect the cellular GSH level in an apoptotic event. The unreacted dye is almost non-fluorescent. After reaction of the dye with GSH, catalyzed by endogenous glutathione-S-transferase (GST) enzymes, the dye fluoresces blue, with excitation at 394 nm and emission at 490 nm. The intensity of the fluorescence signal generated from the assay reflects the amount of GSH that is present in the cells. Data collected using HeLa cells. (A)Live/Dead: Cell viability as measured by the green (live)/red (dead) fluorescence ratio; (B)Caspase-3/7 R110: Cell apoptosis as measured by the caspase 3/7 activity; (C)Glutathione: Cell apoptosis as measured by the glutathione content; D&E: Caspase-3/7 NucView 488. The EarlyTox Caspase-3/7 NucView 488 Assay Kits are also applicable to fluorescence imaging, as the nuclei of intact apoptotic cells are labeled per their caspase activity; (D)Assessment of caspase 3/7 activity on plate reader; (E)Assessment of caspase 3/7 using fluorescence imaging.